With miles of ocean fronts and coastal highways, it’s no wonder California is known as the Golden State. This state is the perfect setting for sun, fun and sushi burritos. Yes, sushi burritos. Reportedly created in California several years ago, sushi burritos are the latest culinary craze today and they’re celebrated at a local sushi restaurant near you. Here we’ll figure out how this Japanese-Mexican dish came to be, its cultural implications, and its longevity. Growing up in the Midwest I have affinity for comfort foods. Serve me a plate of meatloaf and mashed potatoes and I’ll be on cloud nine. No matter my travels or distance from home, those cravings continue to linger. However, over the years, I have become intrigued with food trends. A few concoctions that have left their mark on waistlines across the country include the outlandish Lay’s cappuccino-flavored potato chips (no thanks) and the sublime cronut (so worth the hour I spent waiting in line). Between the outlandish and heavenly, plenty of edibles have been considered food trends, including fried butter and sriracha-doused popcorn. Why? The world may never know. Thankfully, my taste buds survived the onslaught. As a chef, I knew I had to get back to enjoying food trends after the aforementioned disasters. And the latest and greatest sushi burrito trend was what started that process. I must say, when I first overheard a few coworkers discussing this mashup, I envisioned a strange amalgam of tuna, shredded beef, cucumber, and a handful of beans wrapped in a mound of rice and seaweed. Not appealing. Not wanting to admit eavesdropping, I took my preconceived notions and approached the counter of my favorite San Diego sushi restaurant to place my order. Much to my surprise (and relief), my imagination had been way off. This sushi burrito was not a monster meld of two cuisines. No, this was a grand-sized sushi roll created from my choice of ingredients. I’ll admit, with still tormented taste buds from my sriracha experiment, I played it safe with my selection of albacore, cream cheese, and avocado. It was a mouthwatering dish that I enjoyed for two meals (like I said, it was grand-sized). While enjoying my sushi burrito leftovers, I pondered whether this culinary delight could somehow alter Americans’ eating habits. I recognized that even although our country continues to grapple with obesity and its consequences, food trends, regardless of their health value tend to wane after their 15 minutes of fame. However, as a nation, we are starting to take action when it comes to getting healthy. Awareness of food labels, the danger of certain ingredients and understanding the long-term effects of downing a lifetime of fast food is becoming the norm in our dietary regimen. I believe with extensive flavor combinations and the health benefits of sushi, including its punch of omega-3 fatty acids and iron, the sushi burrito is destined to take its place at the table for years to come. My takeaway from this experience? I love living in California, I still crave comfort food on occasion, and found a new go-to with the sushi burrito. My advice to those who have not yet savored this giant sushi roll? Always keep an open mind when it comes to food trends. 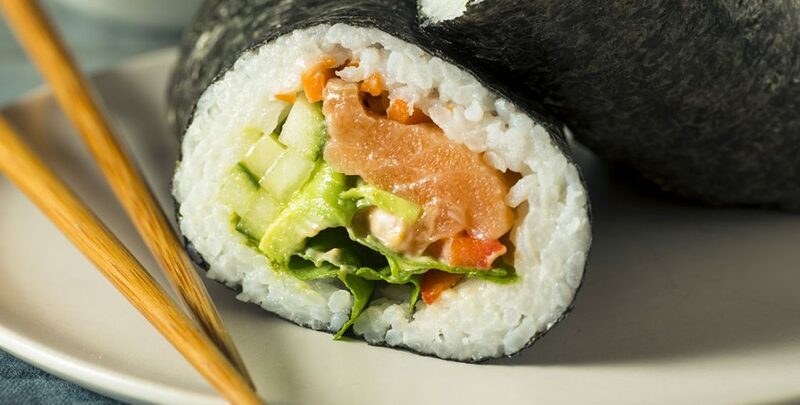 Expand your palate by trying the sushi burrito. You’ll probably be coming back for more and may even help your health in the process.